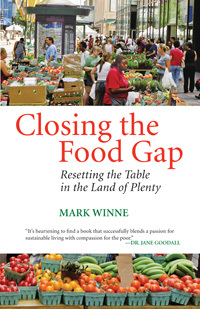 To address these questions, Winne tells the story of how America's food gap has widened since the 1960s, when domestic poverty was "rediscovered," and how communities have responded with a slew of strategies and methods to narrow the gap, including community gardens, food banks, and farmers' markets. The story, however, is not only about hunger in the land of plenty and the organized efforts to reduce it; it is also about doing that work against a backdrop of ever-growing American food affluence and gastronomical expectations. With the popularity of Whole Foods and increasingly common community-supported agriculture (CSA), wherein subscribers pay a farm so they can have fresh produce regularly, the demand for fresh food is rising in one population as fast as rates of obesity and diabetes are rising in another. Over the last three decades, Winne has found a way to connect impoverished communities experiencing these health problems with the benefits of CSAs and farmers' markets; in Closing the Food Gap, he explains how he came to his conclusions. With tragically comic stories from his many years running a model food organization, the Hartford Food System in Connecticut, alongside fascinating profiles of activists and organizations in communities across the country, Winne addresses head-on the struggles to improve food access for all of us, regardless of income level. Using anecdotal evidence and a smart look at both local and national policies, Winne offers a realistic vision for getting locally produced, healthy food onto everyone's table. It didn’t take too many trips to this sort of market before I was sufficiently motivated to go to a suburban grocery store. I was lucky; I owned a working automobile. Up to 60 percent of the residents in Hartford’s low-income neighborhoods did not. Nor, as I would find out later, did the city’s public transportation routes go to the suburban supermarkets. My journey to the nearest full-size chain supermarket was six miles roundtrip. The store had easy vehicular access and a large, well-maintained parking lot, as well as shiny, clean aisles, floors, and food cases. The floor space available for product display was at least twice that of the largest remaining Hartford store, and the products were pleasantly arrayed. The produce section, though not brimming with abundance by today’s standards, was quite ample and free of wilt, anemia, and other symptoms of imminent death. The store’s staff was reasonably friendly, albeit prone to the lassitude common among those who must do repetitive, low-paying work. At least they would help me locate hard-to-find items; those requests were usually greeted with hostile stares by workers at the city stores. Crossing over I-84 from Hartford’s Northend, I entered the city’s downtown business district, still a fairly vital place in 1979. It was filled with bustling pedestrian traffic headed to and from corporate office buildings and signature sandstone department stores. The world-famous insurance industry was a driving force, with buildings sporting the companies’ tastefully understated logos: the Travelers’ red umbrella, the Hartford’s twelve-point stag (or hart, as in hart ford, the place along the river where the deer crossed), and Aetna’s mountain. There was a strong personal dimension to these social and economic circumstances as well. As someone who had moved to Hartford to run a social change organization, I was expected not only to talk the talk but also to walk the walk. The moral burden that I had willingly accepted was that I should live in and be a part of the community that I was there to assist. To commute to Hartford from the suburbs--to be a nine-to-five do-gooder-- was frowned upon and in some cases explicitly forbidden. To only participate in social action had a lower status than to be committed to the same. Think ham and eggs: the hen participates, but the pig is committed.